"I have gone around the country… I now see a more powerful wave than in 2014. All the surveys are suggesting that the BJP is winning three times more seats than the Congress in the Lok Sabha," the Prime Minister thundered at an election rally here. 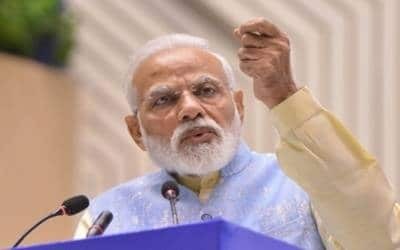 "You have proved the power of Indian democracy… With heavy voting in Jammu and Baramulla, you have given a strong response to the terrorists and opportunists." In an apparent reference to the opposition, he said: "’Mahaamilaavati’ and their ‘rag darbari’ ask why Modi is speaking about protecting the nation. Speaking about the nation is important…"
"While the Vice President, who is not a part of politics, went for a programme organized in Amritsar to pay tributes to the martyrs… the Chief Minister (of Punjab) was missing. He boycotted the programme because he was busy in Congress bhakti. He went there with the Congress President but not with the Vice President. That is the difference between the love for a family and love for the nation."